In 2005 Susan Marie commissioned a UWA Graduate, artist Shaun Tan, to create a west-facing sundial, and now the perfect time and place has been found for its installation. As the Director of UWA Extension, part of UWA’s community outreach, Susan envisioned an accessible public artwork that celebrates a Centenary of UWA’s achievements. Using calculations provided by Dr Peter Kovesi (an engineer at UWA’s Centre for Exploration Targeting), Shaun designed a sundial that measures hours relative to the time of sunset. 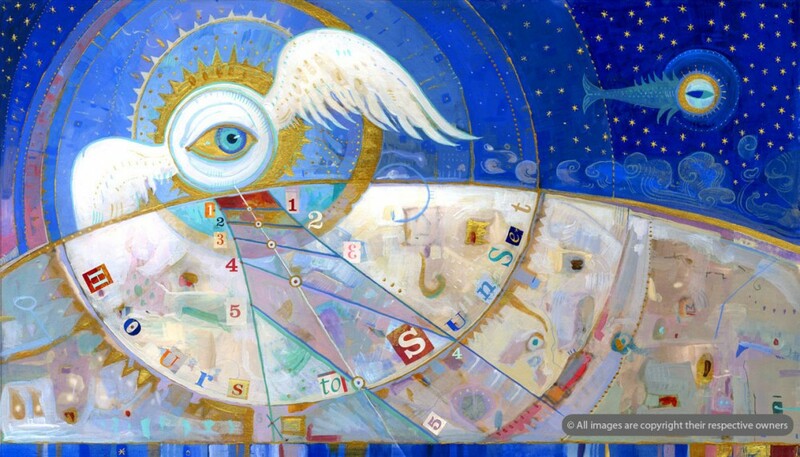 The design casts the sun as an all-seeing bird, with luminous representations of the sky and heavenly bodies recalling the medieval Book of Hours. Once the design was completed, Susan then collaborated with UWA Facilities Management to select the best location for the sundial on the west-facing wall of the University Club. This location is at the heart of the UWA Crawley campus and easily accessible to public transport and parking. Once the location was determined, sponsorship for the installation was required, and the Convocation of UWA Graduates stepped forward as principal UWA sponsor. Other support from within UWA includes Friends of Lawrence Wilson Art Gallery, the Combined Friends Groups and UWA Extension. Support from corporate sponsor Hawaiian was critical to the completion of the project. The next step was to source the tiles, and find the artisans to the translate the artist’s vision into a tangible installation. The Venetian glass tiles were imported from Italy in early January, and construction began on 27 December 2012. The process took 27 days to complete, with the final unveiling on 22 January 2013. Susan, thank you for your perseverance in commissioning Shaun Tan to create the sundial. It is absolutely beautiful. I have great pleasure looking at it when walking my dog through the University grounds each morning. Thank you Melita, but this was the work of many, many people. So glad it gives you pleasure!